As I traveled and prepared for Nationals with my team, I couldn't keep my eyes off what was unfolding in Waterloo at RIM Park; as the 13U boys and girls, 15 and 16U boys along with 17U girls took to the court in search of glory. As defending 15u Ontario Champions the 16U Longhorns were the team destined for championship glory and for the first 7 matches it was looking good. A tough semi-final loss to Pakmen and the 'Horns were on the outside looking in. Coach St Denis was able to regroup his team and win the bronze going 8-1 for the tournament. Back to back Provincial medals is a rarity in our club but something we hope will soon become the norm. Great job by all and a great season that's not quite done yet. We are all looking forward to Calgary and another crack at a title. Meanwhile nearby the 13U Stallions were quietly putting together a perfect record and a march to the finals by downing Toronto Phoenix, the hometown Preds and Oxford Crush on Friday losing only one set, all on their first day. Day two looked on the scoreboard like my dream results day, with wins over Aurora Storm, Leaside Thunder and Pakmen all of which meant that the boys had moved from the #8 seeded position to the 2nd seed going into the final day. I was so pleased to send a note of encouragement to my old friend from high school sports encounters, coach Paul Gratton. His response was humble and unassuming as always: "the boys are playing well, we'll keep you posted tomorrow." Now I am aware of what being in the "hunt" on day 3 for a title is like and knew in my heart Paul would be distracted so regular trips to iset.net were the fare for the day as we continued our 17U team building in the greater Maniwaki region. Keeping and eye on everyone in Waterloo, our team discussed what it might mean to start your club career as a champion, we all checked in regularly. In the early morning Sunday the story continued to unfold, a convincing straight set win over Oakville Thunder, which meant a guaranteed medal game for these youngsters, step one complete. So here we are; a group that would play it's first final of the season at the Ontario Championships. The excitement in the arena for the families and players was bordering on pandemonium. However for the man in charge, he would be calm and pragmatic as one last win would be the toughest task of all. Back home it was time again for distracted anticipation. Now on the road home, the word came at me from all directions... 13u GOLD for the Stallions. "Amazing", "WOW", "So Proud", "Unbelievable" were the superlatives. Happiness for an old friend was the thought that I couldn't avoid. Winning a championship with your son (or daughter). So many of us have dreamed that dream and found out how hard it is to do. As the OVA twitter feed came through, I realized that it was three old friends who all shared that moment. Kudos also go out to assistant coaches, Louise Archer, Steve Call and Patrick Deschenes who also all have sons on the team. But wait we are not through yet. The Stallions brothers the 13u Broncos also put together a solid performance for their first time at an Ontario Championship as well. Wins on Day 1 against PVB and Markham gave this group a quick start to their weekend. Day 2 came early and hit back hard with Predators and LVC taking the first two matches of moving day but coach Sylvain Ducharme was able to raise the team's spirits and get a win over London Forest City. That meant a pre-quarter final very early Sunday to try for the top 8 as well. 8:00am Sunday is tough for anyone at the best of times and the Broncos got out to a slow start in the first losing to Storm 25-18. With their backs against the wall and the season at stake they fought with their every breath to an thrilling 29-27 second set win and force a third. But the Storm was a little too hard to weather and the boys would fall short on this occasion. All in all, a great result considering this is the first time we have had TWO thirteen U boys teams and they are both top 16. Great season and thanks from all of us. Let's stay with the boys side for now and bring you up to speed on the 15u Wildcards. A group that almost wasn't at the start of the season and had made their way up the ladder into the premier division for their final tournament. Coach Yuri Shteinman has a knack of getting the most of his team in April and hopes were this year would be no exception. Day one was crucial for the team, only the top finisher could move into the top 8 power pools on Saturday. 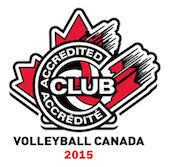 The team responded with huge wins over PVB, Storm and the home town Waterloo Tigers. Moving up with the big boys again for day 2 action, things would get hot for sure. The Wildcards would find themselves thick as thieves having to face Predators, Rapids and Fusion! All top tier teams all season long. The 'Cards didn't disappoint going three with both Preds and Fusion before posting a valiant 0-3 day. But the back door was still open and it was up to them to barge in. Looking back a gut-wrenching loss may have cost them a glorious opportunity. In losing to Storm Inferno in a heartbreaking 3rd set the boys missed a chance at a quarterfinal re-match with PVB, whom they had beaten on Friday. That same PVB group went on to win bronze. So close .....yet so far. So now over to the ladies side of the equation. At the 17u age division two Maverick teams played in two different Divisions. The HP BlackJacks came in to the tournament as the lucky 13 seed of Div 1 while the Twisters were in at #3 in Div 3. Coach Colin Walker was in hot water early as they ran in to a buzz saw in their opener in the Pakmen 16u team, a group that had just won the 16u Championships less than a week ago. The BlackJacks were ready having seen film on this team. Their maturity showed in winning a convincing 25-20 opener. Not surprisingly the group from Mississauga rebounded with a much better battle in the end stealing a 26-24 win and the momentum going into the third where they pushed through to beat the 'Jacks in three. Not the start we were looking for but some foreshadowing of the rest of the weekend. Regrouping and determined the girls played solid and won their next two securing a spot in the top eight grouping. A solid boost from that #13 entry. The Twisters put in a perfect opening day for Coach Richard Schwartz defeating Tigers, E381 and Markham Thunder thus retaining their seed for day 2. There they had an early wake-up call in the first match against LVC Fire Ignite but rebounded to win over both Georgian and ACTS Elite. A solid 5-1 record over two days, however that one loss put them in a direct path with the #1 seed Lakers from North Bay and our girls dreams ended there with a thud on Sunday. After the dust has settled this group deserves a big round of applause for a fun filled and action packed season. In the 13u Championship on the girls side again two Maverick squads battled for Div 2 honours. After a great year of development the Rattlers came in with the #11 seed and Sidewinders the 22nd. Day one for the Sidewinders unfolded as a big success, right out of the gate coach Gary Sweet's charges posted a win over the top team (Phoenix Spark) in their pool followed by another over Halton and the girls were cruising. They hit a bit of a bump against the Barrie Elites in their final match spoiling what was almost a perfect day. Saturday the final tally was the same as Friday only a little different order. An opening win over another Phoenix squad and final match win over Galaxy jets were sandwiched around a lost to the Burlington Blaze. After two full days a 4-2 record and a date in the quarter finals. Now I wasn't there... but I can't help but wonder if everyone noticed that a win over the Chatham Ballhawks would possibly result in an all Mavs semifinal... the Sidewinders were certainly out to make it happen in the second set after letting a tight one go in the first. 25-10 in the second and all things looked good for the third. What a thriller it must have been as the two teams from opposite ends of the province battled it out to a devastating 17-15 Chatham victory. Final result was a move from 22nd entering the weekend and coming out in the top 8 tied for 5th. A big indicator of the team's improvement over the season. Now it was up to the Rattlers. The Maverick Rattlers U13 girls team set out for their first game at the Ontario Provincial Championships at RIM Park. In Coach Rob McMullin's first game of the tournament, the Rattlers played against the PVB Patriots going to just two sets for a win. Their second game against Phoenix Blaze was another quick win within the first two sets. The third game against the Warriors proved to be more challenging and while they won their first set with an impressive point spread, the next two matches were much closer and ended in losses. Winning the tiebreaker they still ended up in first place in their pool. Day 2 started strong with two wins in the morning against Twin Bridge Thunder and Etobicoke Titans. The afternoon game against MVC Maroon ended in a loss with very engaging matches. The team lost the first set, went on to win the second set and then ended up with a loss in a very close match in the third set. Day 2 ended with the Rattlers finishing 2nd in their pool. The team was pumped as they headed into day three. It was an early morning start and they played their first game against NBVC winning the game in the first two sets which also brought them to quarter finals. The second game against Burlington Blaze was also a win in the first two sets. They continued this trend in the third game against the Chatham Ballhawks also winning the first two sets. This win put them into to the Gold round. In the gold round, the Rattlers faced the Lakers quickly winning the first set, losing the second set in a very close match and then dominating the third set. The girls played hard, brought their best game and ended with a well-deserved Gold medal! Congratulations to both 13u teams for a great end of year tournament. Get your self ready for a fun ride next season. What was it Timbuk Three said...the future's so bright, I gotta wear shades! Great work everyone, players, parents and coaches all.